If you have recently updated your cPanel servers to 11.46, you may have received something that looks like the following alert. WHM has detected a manual hostname change. 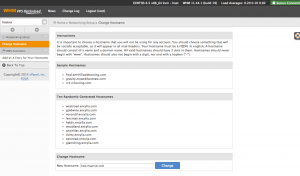 Update your hostname in WHMâ€™s (http://new.hostname.com:2087/scripts2/changehostname) interface (Home Â» Networking Setup Â» Change Hostname). If you did, then that means that your hostname was updated outside of WHM after cPanel was installed on that server. The fix is simple. Thanks for the info. I go through GoDaddy for hosting. I have a Private Virtual Server with them and a while back (maybe 3 weeks or so), I changed the hostname and created an A entry (?) for it. I haven’t touched it since. Today, I got an e-mail giving me the message you got. However, when I went into WHM and did what they said, it still listed the hostname that I set up. I changed it to the same hostname though, thinking maybe something had happened. Any idea why I got the message? Thanks! I’m not entirely sure on the logic, but I know the alert doesn’t trigger every time. It’s possible that it didn’t catch it, but pretty unlikely. I would just re-set the hostname through WHM and see if it comes up again.